I’m not one to fall into the whole high protein shenanigans of protein shakes and bars. Generally speaking, American diets are not lacking in protein. I do, however, watch my carbohydrate intake because of PCOS and my blood glucose issues. But putting aside my beliefs and health issues, including protein to your morning meal is simply smart. Protein adds balance and satiety that lacks in most breakfast options. A bowl of oatmeal or cereal, for example, lack fat and protein unless added in. Those carbohydrate-rich meals, complex (those containing fiber) or not, tend to have people hungry by the late morning hours. If you’re growling by 10 am, you either need a snack, and/or more protein in your breakfast meal. Combine all the dry ingredients in a bowl. Add the mashed banana, milk and vanilla and stir together until just combined. In a small bowl whip up the egg white until it’s frothy. Add it to the rest of the batter. Bake in a heated waffle iron or cook on a griddle/pan for tasty protein filled breakfast goodies. Yield: 1 serving (1 large waffle or 3 small pancakes). Question: Do you having a filling breakfast that holds you until lunch, or do you snack mid-morning? Do you find protein in the morning helps to keep you full for longer? 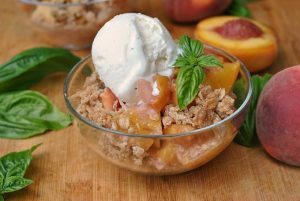 My husband will appreciate this recipe! I’m a frequent eater, so 99.9% of the time I snack before lunch. Have a great Monday! I thought for sure protein waffles meant ones made with bacon bits and a side of sausage :). Usually no breakfast for me. I usually get full for 4 hours from either oatmeal, or a smoothie and toast with peanut butter! Working in a school, I don’t have time to snack mid-morning, so my breakfasts are typically the largest meal of my day. I do find that a combination of whole-grain carbs, protein, and healthy fat is the best way to satiate my hunger for 5 hours. A spoonful of peanut butter on top of banana oatmeal is one of my go-to breakfasts, as is Greek yogurt with fruit, a bit of cereal or granola, and (of course) a spoonful of peanut butter. I usually eat once in the morning then at lunch. Sometimes if I remember to bring some nuts to snack on mid-morning, I will. Without them, I’m usually starving by lunch. I think the only breakfast that really keeps me full for a long time is eggs–but I don’t make those during the week since I make breakfast at work. 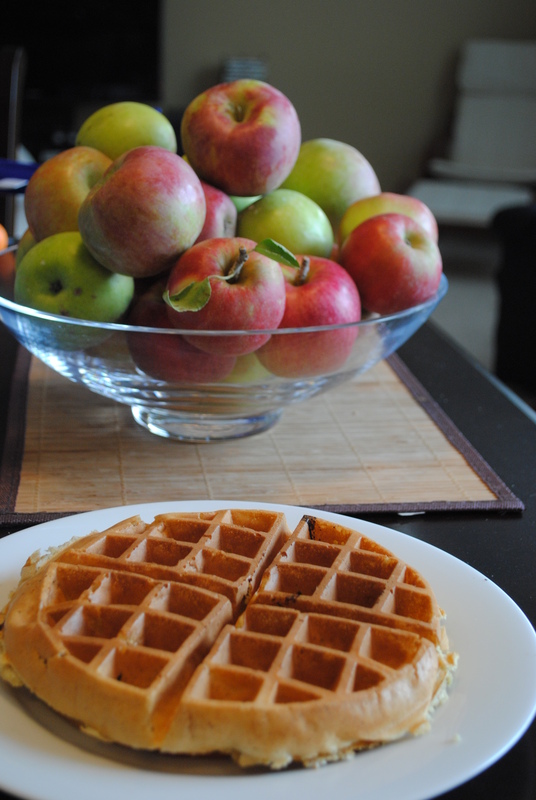 These protein waffles look good…but my eyes are drawn to those beautiful apples!!! Yowza! These look great Nicole! I usually have a mid morning snack regardless if I am hungry or not since I do not eat lunch until 12:30. It helps me from overeating at lunch! I have oatmeal everyday, but without loading it up, I’d probably be starving after an hour… I always add stuff like peanut butter, flax, granola, etc. mmmm…. I am HORRIBLE at eating breakfast in the morning. It seems like when I do have eggs and bacon or something before work, I’m STARVING by 10am and consider eating my desk at work. I can’t wait to try these, they look delicious! I don’t buy protein powder – I’ve never really liked it. 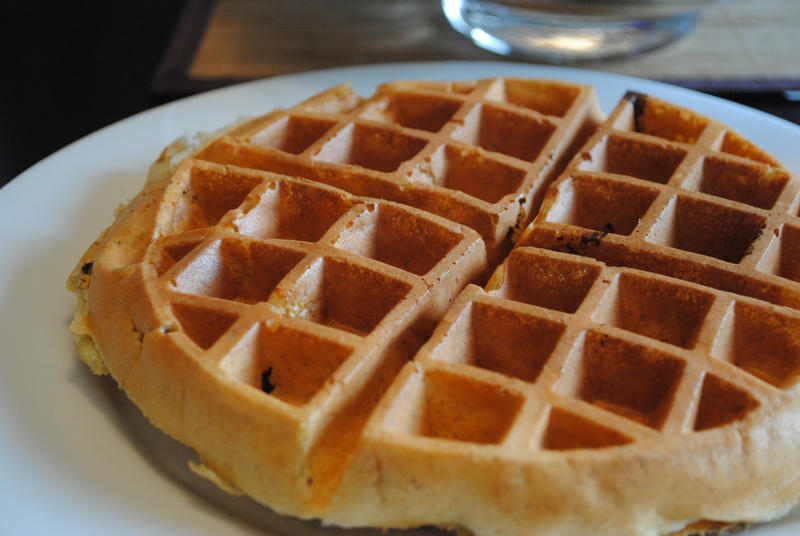 Perhaps I can find a small container to try these waffles – they look delicious! Chocolate protein powder makes me gag a little. I much prefer vanilla. Or unflavoured. Protein definitely helps to keep me full in the morning. A bowl of oatmeal with pb holds me over so much better than a bowl of cereal. I always try to get protein in with breakfast. I am a snacker so an AM snack between breakfast and lunch is normal even if I have a filling breakfast. I’ll definitely be trying this recipe out one morning. Lily is so cute! I love that picture. I almost always have the same breakfast (oatmeal), and it keeps me full on the weekend no problem. But for some reason, during the week Im usually starving by 9am. Probably because Im sitting at work all day and am just looking for something else to do. Love the Lilly pics to put a smile on my face! I usually do some protein in the morning..eggs, greek yogurt, or pb, mainly. I usually don’t have a huge breakfast cause I pack it and take it to work so I will snack on some fruit before lunch. That protein waffle looks delicious!! An egg and cheese sandwich always holds me the best in the morning. Overnight oats are in 2nd place. And yes, I try to make sure to eat some protein with breakfast. It definitely makes a difference as to when I get hungry. My usual breakfast is oatmeal with Greek yogurt and some walnuts. It does a pretty good job keeping me full. that lily picture totally made my day!!! I try to eat a filling breakfast without a snack between breakfast and lunch (oatmal is my fav!). The waffles look incredible! Awww, what a sweet pic of Lily! I need a waffle iron SO badly!! I LOVE waffles (and pancakes) but they never fill me up. So this would be perfect! I have oatmeal with a banana every morning, but have to add in some almond butter for staying power. Then I snack on almonds after that if I’m still hungry. I definitely need some fat/protein in the a.m.! Awww, Lily makes my heart happy! What a cutie pie. I am a big grazer, so as much as I love a big breakfast on the weekends, I prefer smaller meals throughout the day. So a smaller breakfast & a snack is my go to! 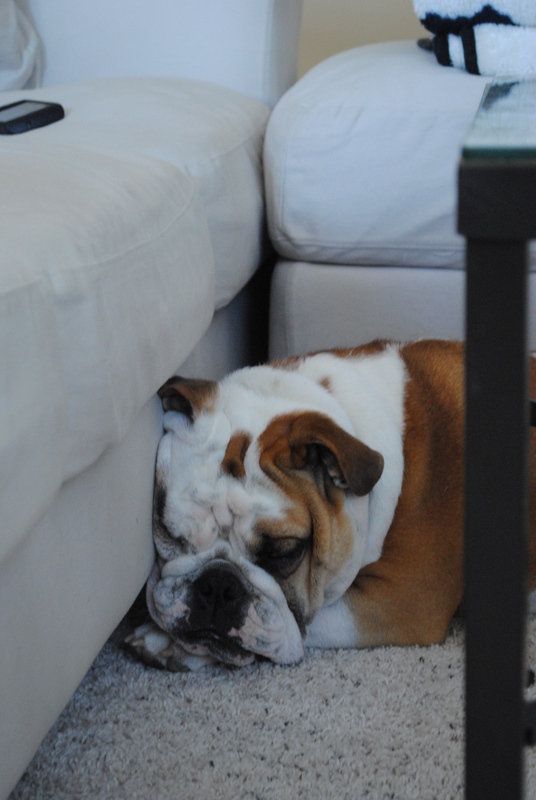 Lily is so adorable, I always appreciate the doggie pics! I like to have a high protein breakfast and like to mix it up between oatmeal (only when its cold out though, I cant eat it when its hot out ), eggs and Kashi. I completely agree! I’m not usually into protein bars and powders but these really keep me full for a long time! 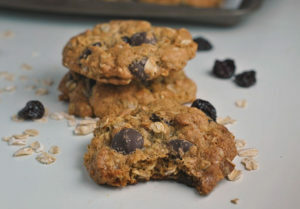 I tried making them with buckwheat flour this week and they turned out great! Glad you liked them! Hi Cheryl. Actually, 61 milligrams of cholesterol is about 1/3 the amount in one egg…definitely not a high amount at all.